The 7K4 Four Post Parking Lift is definitely an industry favorite, sharing the advantages of a two post car lift with the addition of portability and easier installation. Although they may be bolted to the ground, four post lifts can be self-standing and even “mobile” if customers attach a caster kit. In this sense, four post lifts are more “portable” and easier to install than their two post counterparts (which need to be securely anchored or bolted to the ground in all cases). Four post lifts however, take up more footprint and may not be the best (or even a viable) option in situations where space needs to be maximized or is simply not available. Some customers find four post lifts more stable and convenient while others find them cumbersome and less elegant than the two post lift option, therefore preferring the two post for those projects where aesthetics play a bigger role. 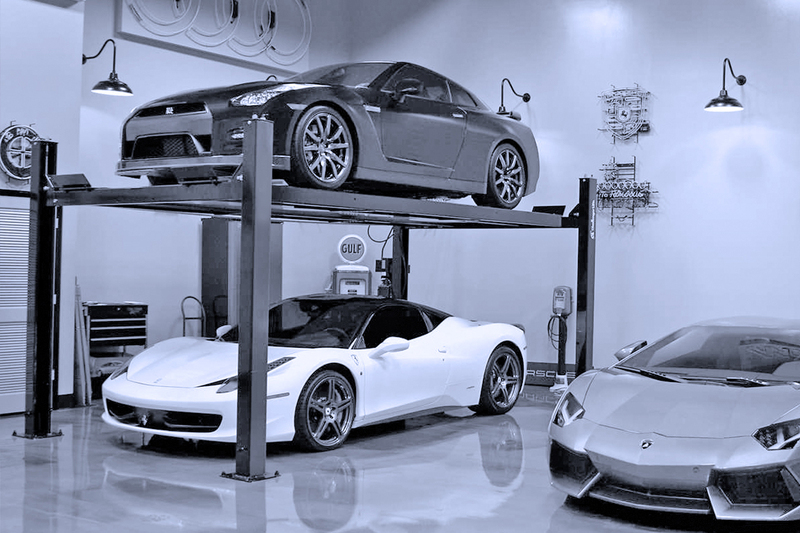 Another matter to consider when choosing a vehicle lift is that the two post offers a higher platform elevation to accommodate taller vehicles or offer more comfort and convenience in spaces where ceiling height is permitting. Controls: UL Certified, 100% Made in America Standard Controls or customize your control panel. For product dimensions, weight, capacity and electrical information request our Technical Data Sheet info@duplii.space. If you are in the Dade/Broward/Palm Beach (Florida) tri-county area the following extra services are available to you.